After a few seasons without them, Dean returns to a “brown label” shirt. Like a few of his S1 shirts, this shirt has a small brown label on the left breast pocket. It’s green, with green buttons. It only has one breast pocket and there is no pocket flap on it. Dean is wearing this in Yellow Fever (4x06), when Sam finds him rocking out to “Eye of the Tiger.”He wears it until they have to change into suits to go interview Luther’s brother. In 99 Problems (5x17), this might be the shirt that Dean is wearing as he and Sam flee the demons at the beginning of the episode. He has taken it off by the time they arrive in Blue Earth after having been rescued. We see him put it, along with Sam’s shirt, in the trunk of the Impala upon arrival. 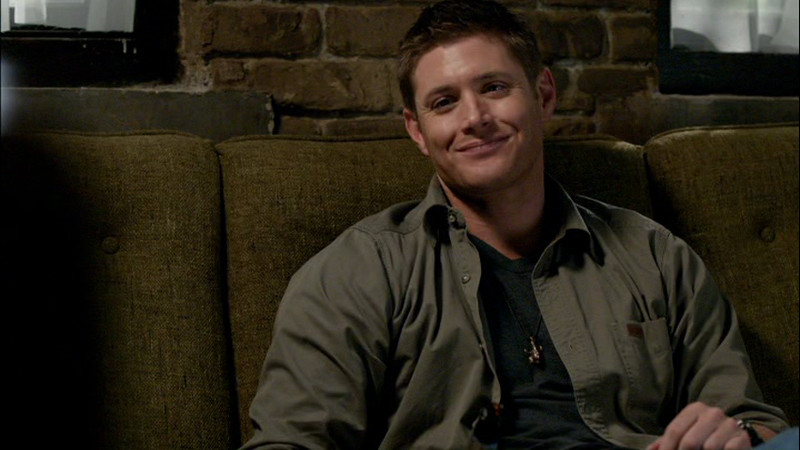 In Hammer of the Gods (5x19), Dean wears this shirt for the entire episode. In The Devil You Know (5x20), Dean wears this shirt for the entire episode. In Meta Fiction (9x18), this shirt makes a surprise comeback when Dean wears it for the entire episode.